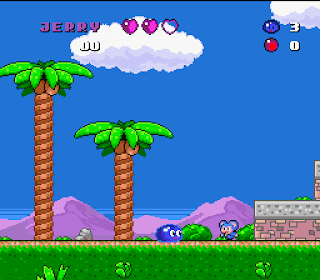 Today we're going to take a look at one of the many hidden gems on the Super Nintendo. Smart Ball is definitely a game that flew under the radar of many SNES owners back in the day, but for those that gave it a shot, they were in for a colorful treat! Please continue on and find out a bit more about Smart Ball! I was one of the fortunate ones (fortunate few?) that got to experience this game back when it was originally released. 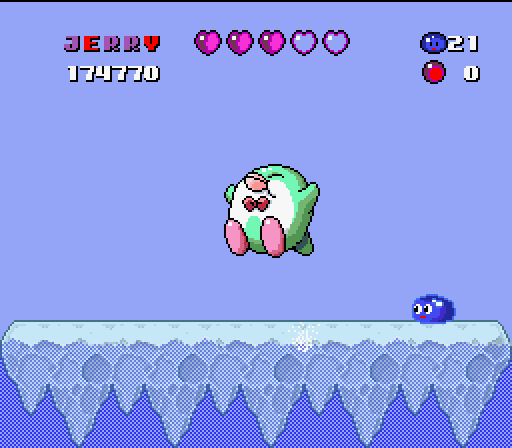 The first time I saw Smart Ball was in a Super NES Player's Guide that Nintendo released. There were three screenshots in the back of the guide and a paragraph about the game. I didn't think anything else of it until I encountered it at a local video store for rent. I almost didn't even pick it up because the main character looked like a hockey puck and I thought it was a sports game. I was a kid! Give me a break. After noticing the big bird in the background and that the "hockey puck" had a face, I picked it up figuring it might not actually be a sports game. Turned out I was right, and I immediately recognized it as being the game in my Player's Guide! 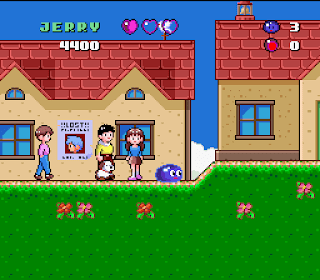 I ended up renting it and found it to be a very fun, colorful, and happy game. 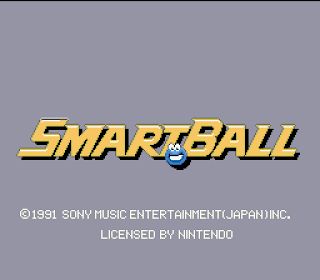 I wasn't able to rent games that often as a kid, but Smart Ball was one I definitely rented on more than one occasion. 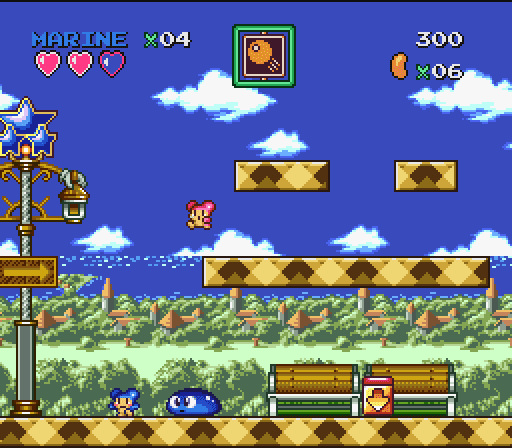 It left enough of a mark on me that I used up several rare game rentals playing this instead of a new game I had never tried before. Almost too adorable to kill. 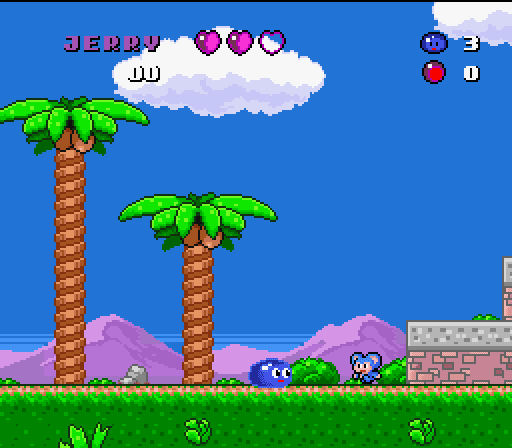 In Smart Ball, you play as a prince named Jerry who has been transformed into a blue blob by an evil wizard. You have the ability to cling to walls and ceilings, as well as stretch your body to attack your enemies. Pressing up on the directional pad stretches Jerry up where he can attack from below. 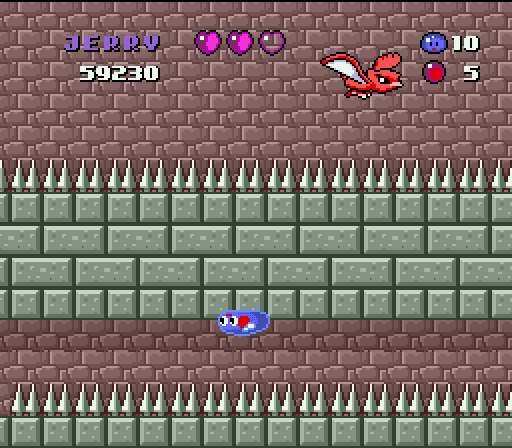 Pressing down on the directional pad flattens Jerry out, allowing him to defeat enemies coming at him head on. You collect balls from flowers that have different properties. 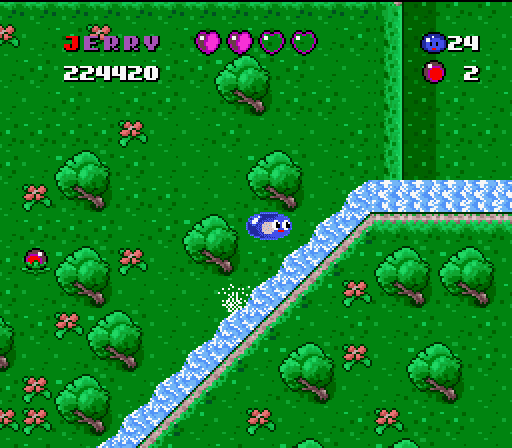 For instance, the white ball "jump" lets you jump higher, the green ball "seed" sprouts a plant beneath you allowing you to reach higher places, and the black ball "iron" is a reusable projectile Jerry can launch at foes. 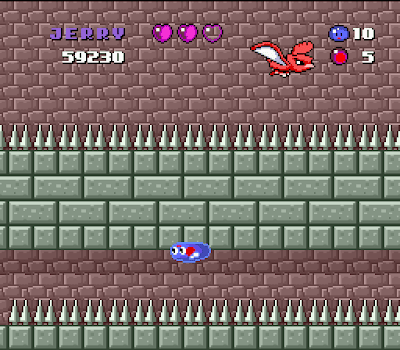 In addition, there are also red balls that you can gather and launch at enemies. 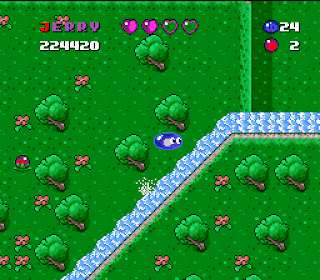 The red colored balls typically show up in flowers you have already taken the contents of. 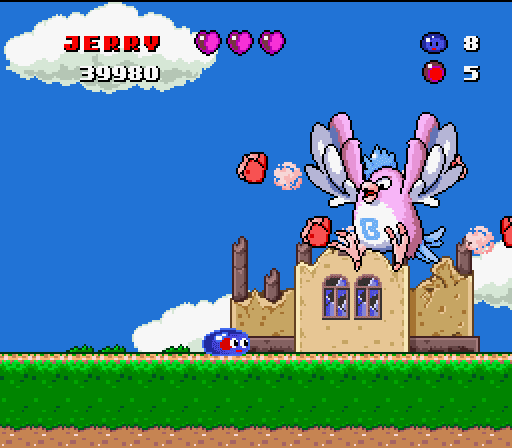 They are good weapons to use against the varied and colorful bosses. The game has many different levels taking Jerry through a vast variety of terrains. Places you'll visit include a city, a forest, a desert, an icy wonderland, and even the Moon! You definitely won't get tired of seeing the same landscapes over and over again. Each level is unique, beautiful, and exceptionally colorful. There's not a dull moment in Smart Ball! Strangely, in the Japanese version of the game, there are towns you can visit. There is also a storyline that was completely omitted from the American release for some reason. There is no dialogue anywhere in the American version of the game. Very strange! Not that it's a plot-heavy game or anything, but it seems odd to take out every bit of story the game has. 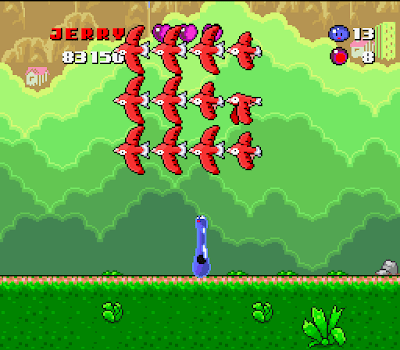 The only real flaw I can see with the game is that the controls can be a bit off at times. 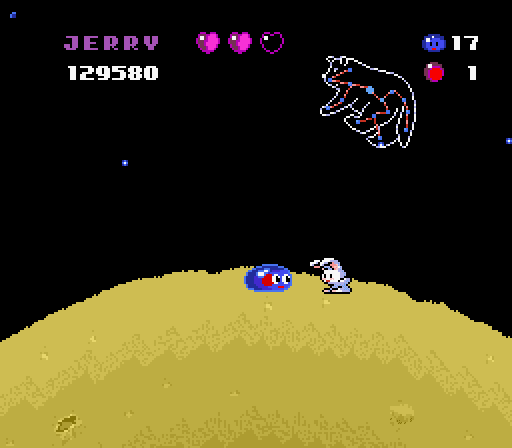 Sometimes Jerry will land exactly where you want him to, and other times he'll completely overshoot the mark. Also, sometimes sticking to walls or ceilings doesn't seem to work 100% of the time. It's not enough of a complaint to hold against the game, but it's something that comes up occasionally. Squeezin' through the city pipes! 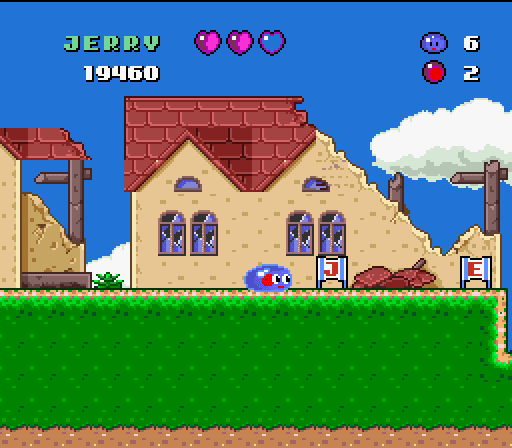 Jerry can stick to walls and ceilings, avoiding traps! Dodging foes in the desert. It must be heard! There's not a single bad track in the game. 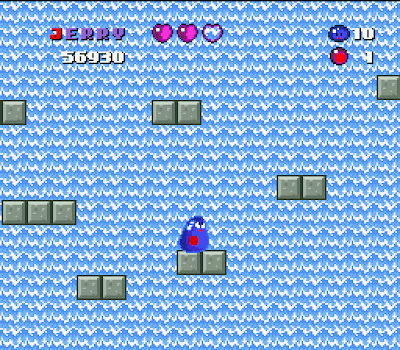 It's amazing that such an incredible soundtrack is tucked away in this kid's game about a little jelly ball. The music is so varied but fits in each level so well, from the peppy first stage music, to the melancholy ruined town music, to the chilly ice world music... it's all spot on. 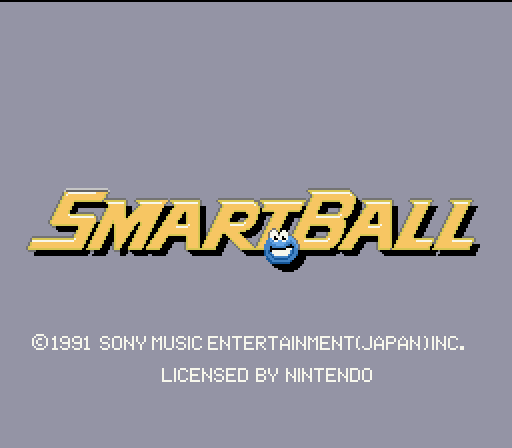 Smart Ball has an amazing soundtrack from start to finish. The Moon has some amazing music that just makes you feel like you're slowly leaping across the surface. 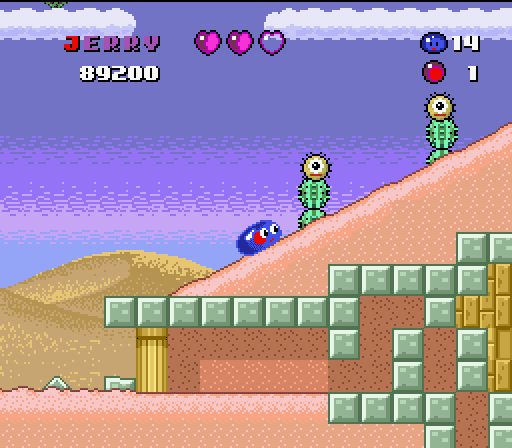 The desert level music has an Arabic quality to it that's just great. Near the end of the game, you'll find yourself in a water world that has some truly beautiful music. It's all so good! 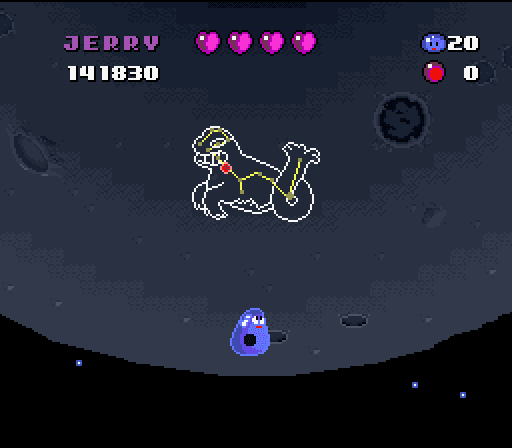 Smart Ball has quite a variety of bosses! Some of... well, actually all of them are pretty nonsensical. One thing they all have in common is that they're all super colorful and cartoony! Take a look below at the bosses you'll encounter in Smart Ball. 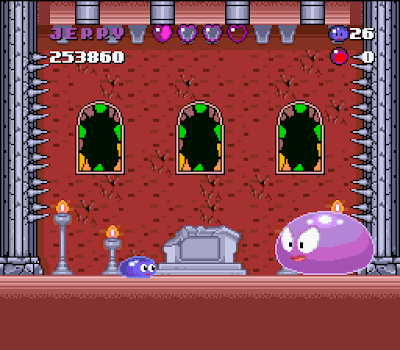 It's worth noting that there was a planned sequel to Smart Ball called Jelly Boy 2. 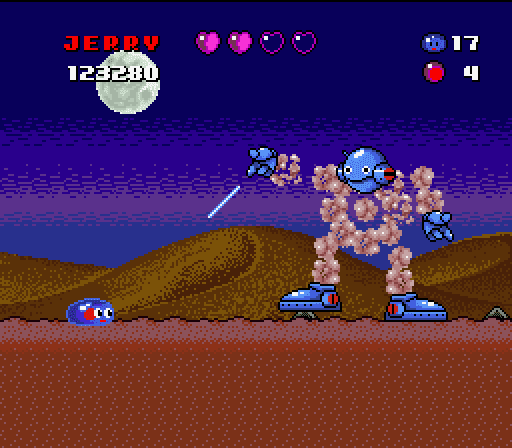 Why it wasn't called Jerry Boy like the first one I don't know, but it's also odd because there's a completely unrelated PAL game called Jelly Boy by Ocean. It's quite confusing! 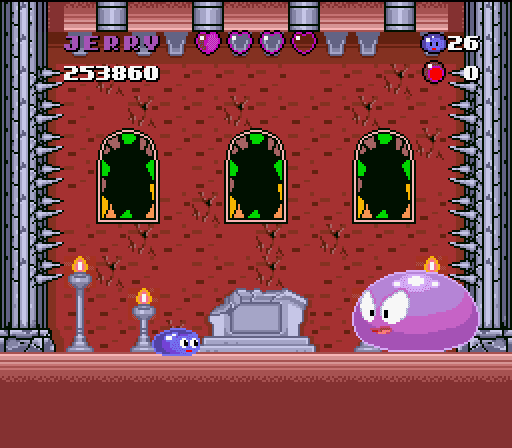 I'm also not entirely certain why Jelly Boy 2 wasn't ever officially released. Granted I haven't played through the game completely, but it seems very far along, if not completely finished. 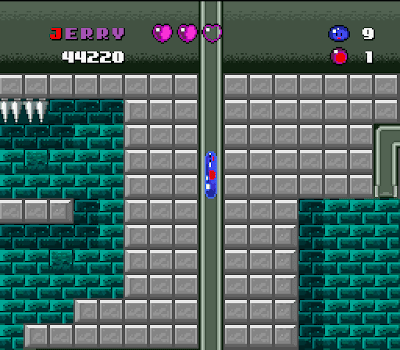 From what I have played of it, it seems to be a very enhanced sequel to Smart Ball, but it's just lacking the charm that the original one had. It's certainly not bad, but I do vastly prefer the first game. That being said, it's a shame that it was never released. I think if it had been, it might have given the first one a little more recognition. Since my youth, Smart Ball has always been a very dear game to me. 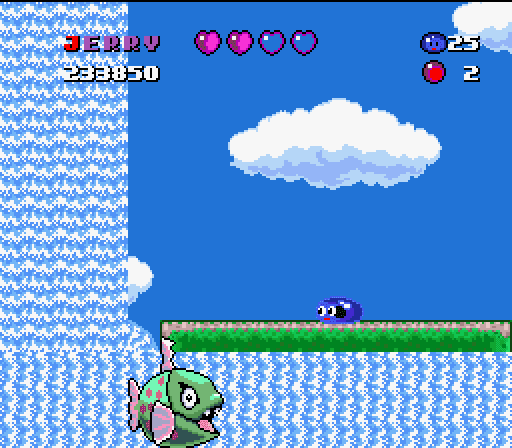 It's such a cheerful game! It might be impossible to be sad while playing Smart Ball! I haven't tested this theory yet, but I can't see how it's possible. Even the enemies are adorable, though sometimes I do feel bad about killing them, like the mice in the first level or the rabbits on the Moon. 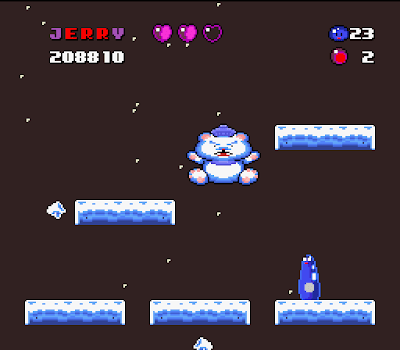 Even with the aforementioned control issues, the game is still very fun. They're not so bad that they'll keep you from getting through the game, but there are times where you'll take unnecessary damage or end up in a pit because Jerry didn't go where you wanted him to. Still, it's not a difficult game with the exception of a few platforming areas and maybe a boss fight or two. Seek Smart Ball out of you don't own it or haven't played it before. You won't be disappointed!